Duties: Assists in daily operations of the hospital gift shop. 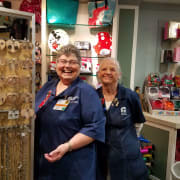 Runs the register, opens and closes, pricing of merchandise, inventory, restocking of items, and maintains gift shop, including work in stock room with additional training. Commitment: Volunteers commit to at least 4 hours once a week and an overall total of 100 hours completed before resigning. Previous experience in retail, customer service, cash register is preferred, but not mandatory.